Clayton Thorson (18) signed his letter of intent to attend Northwestern on Tuesday. Thorson, from Wheaton North High School, has family members who have played in the Big Ten and the NFL. 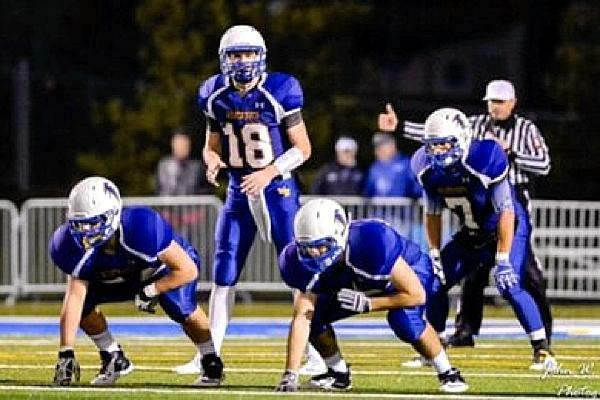 Wheaton North quarterback Clayton Thorson might as well have been born with a football helmet on. His family is littered with football players – his two brothers play wide receiver and tight end at Wheaton College and his dad, Chad Thorson, played linebacker for the New York Giants. But despite the inspiration of his family members, Thorson always knew which position was meant for him. “I’ve always wanted to be a quarterback since flag football in third grade,” he said. Luckily for Thorson, he only had to walk next door for a QB mentor. His neighbor, Kent Graham, played college football at both Notre Dame and Ohio State, and in the NFL with the Giants. Graham and the elder Thorson missed being on the Giants together by one year, but their wives were best friends growing up, so the two players remained in touch. Graham began preparing Thorson in the seventh grade, when the two would throw two to four times a week in the spring. When he reached high school, Thorson and Graham would watch film on star NFL quarterbacks like Peyton Manning, Drew Brees and Tom Brady. The hours of tape watching paid off. When Thorson was a freshman at Wheaton North, it wasn’t hard for coach Joe Wardynski to notice his young quarterback. “The coaches were already excited about his athleticism and size by the time he was a ninth grader,” Wardynski said. But as talented as Thorson was at the time, he didn’t make his way onto the varsity team until his junior year. And even then, his path to being the full time signal caller was blocked by an upperclassman, John Peltz. Wardynski said he realized Thorson, who was getting looks from Big Ten schools before he took his first snap of varsity football, was too good of an athlete to keep off the field. So Thorson took the field as a wide receiver and split time with Peltz at quarterback, and the move to wide receiver actually ended up improving Thorson’s pocket presence. The wide receiver experiment lasted until one cold November day in Wheaton North’s postseason, when Thorson was making a play on the ball and was injured. Thorson, who was then preparing to take the reigns of the Wheaton North offense for the first time, was waylaid with months of recovery. Stakes were high, as the quarterback already knew he had the potential to land big-time scholarship offers if he kept improving. Thorson used his healing time to get stronger and work on his passing abilities, already having the dynamic running abilities of a star. It was the little things like his footwork that led to bigger and better changes in Thorson’s accuracy. That hard work paid off Thorson’s senior year when he amassed 2,809 passing yards with 29 touchdowns while running for 567 yards and 12 scores. The changes in his game caught recruiting analysts’ eyes. He started moving up ranking boards and was invited to the Semper Fidelis All-American Bowl, where he was named MVP of the game. NU was no stranger to Wheaton North. Coaches had stopped by the suburban Chicago school to check in on Thorson as he progressed throughout his high school years, but the recruitment intensified the summer heading into his junior year. First, it was recruiting coordinator Matt MacPherson. Next, offensive coordinator Mick McCall. Finally, it was coach Pat Fitzgerald with weekly calls. “They’re very intentional about taking the time to talk to you and get to know you before they even offer you a scholarship,” Thorson said. That offer finally came from Fitzgerald when Thorson visited NU for its game against Vanderbilt. Then when he saw the Wildcats snap their bowl losing streak, the “Gator Bowl effect” kicked in. Thorson’s family, however, had a rich tradition at Ohio State. He had cousins who kept telling him to visit Ohio State. His dad, a Columbus, Ohio, native, turned out to be the first in his family to not be a Buckeye. Thorson followed his father’s lead and shifted his Big Ten preference from Ohio State to NU. “That quickly changed my junior year,” he said. It finally hit Thorson that Evanston would be his hometown on his overnight visit with sophomore superback Dan Vitale, who went to rival high school Wheaton-Warrenville South. It was the connection with the players that really stood out for Thorson on that visit, and it became even more evident after a film session with Fitzgerald and McCall. Like his new teammate Justin Jackson, Thorson was coming back from visiting another Big Ten school, Penn State, when he finally threw in the towel for his recruitment. He called an “overjoyed” Fitzgerald on St. Patrick’s Day and told him he wanted to be a Wildcat. Barring numerous injuries, Thorson will redshirt his first year in Evanston. As a competitor, he wants to be on the field helping his team win, but he understands the process it takes to become a quarterback in college football. Thorson has set his short-term goals on acing his work in the classroom and getting better each and every week for his team. In the future, Thorson might share snaps again behind center, but this time with freshman Matt Alviti. Thorson has already developed a relationship with the Park Ridge, Ill., native after Alviti was his host on an official visit, so there shouldn’t be any concern about potential bad blood between the two. Thorson lives by the “take it a game at a time” approach, but he made it no secret that he hopes to follow in his father’s footsteps.